As with the the twist necklace, it's easy to make your own bead ring using a few seed beads or Swarovski ® beads or even beads made from Fimo ® clay. For a twist bead ring,you need brass wire (about 29 gauge) or you can also use silver wire. You start the ring by twisting the wire three times round a pen or a lipstick holder of the same thickness as your finger. Twist together the two pieces of wire left projecting from the ring to fix it in place, then thread on a big bead. Then let your imagination take over, thread seed beads, Swarovski ® beads left over from your last creation or why not Fimo beads. 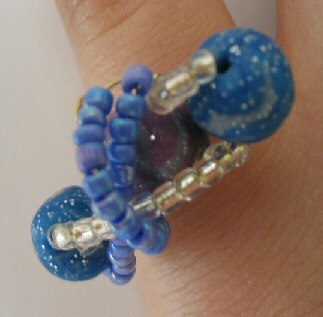 For teenager kids,there's also smaller rings, with "spinning top" Swarovski ® beads, just like for the adults. 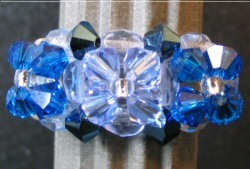 This is the same Ceuta ring as in the 'Jewelry and beads' shop, and it comes in kit form and several different colors. 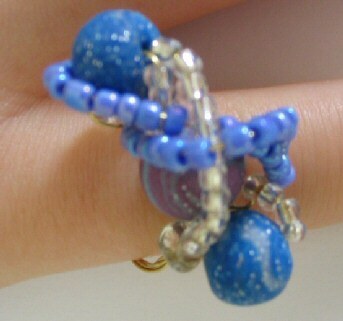 To make a more structured bead ring : Instructions for bead ring models.